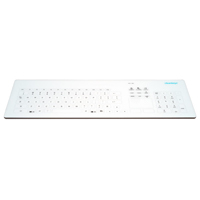 The Smart Clinical Financial Compact Keyboard with Touchpad by Indukey features a closed silicone surface which completely protects the device from liquids and dust with an IP68 protection level. 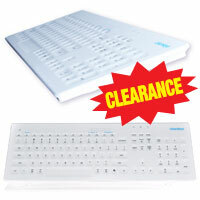 This makes these washable and disinfectable keyboards ideally suited for environments with high hygienic requirements. 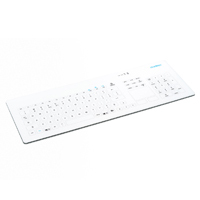 The embedded touchpad pointing device with left and right mouse click button and provides a complete all-in-one solution. 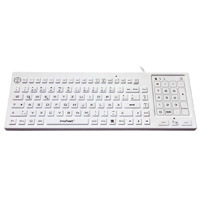 The keyboard is 377 mm x 157 mm x 15 mm and weighs 800 grams. 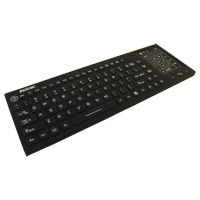 This keyboard uses carbon contact technology keyswitches (1.0 mm travel) with 153 grams (1.5 N) operating force rated at 1 million operations. There are four individual contact points in each of the four corners of the keyswitch to ensure that the key will generate a keystroke regardless of where the user presses on the top of the keycap. 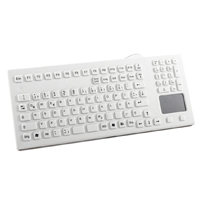 The layout features 106 keys and includes a numeric keypad. 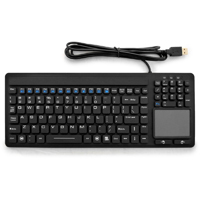 The Industrial 102 key Keyboard with Cursorpoint from Solidtek is a full-sized, rigid, silicone-sealed keyboard with a cursorpoint mousing device integrated below the spacebar, enabling complete computer access from a single device. The sealed silicone cover provides protection from dust and a wide range of liquids and can easily be cleaned with soap or many other non-petroleum based cleaning agents. The design of the keyswitch does require a clean central pressure or there can be a tendency for the keycap to 'rock' and fail to activate the switch. 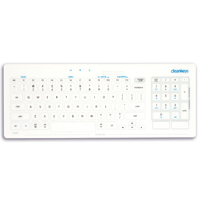 This keyboard is designed primarily for locations where exposure to dust or liquids will drastically shorten the lifespan of traditional keyboards and where limited amounts of data are being entered. The easily cleanable surface also makes it suitable when germ control is a consideration. 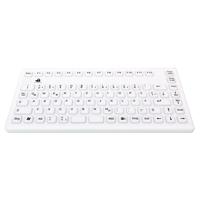 Since users in these environments may be wearing gloves the keycaps provide a smaller contact surface with a significant spacing of 5mm between keys, reducing the potential for accidental activation of adjacent keys.